Can We Redesign the Universal Joint? CCTY Bearing manufactures bearings and assemblies with an eye on custom applications. One of their recent applications is the square ball universal joint, designed for transferring torque in applications with misalignment and a redesign of what most of us think of as the standard universal joint. Based on my years in product development focusing on steering columns and intermediate shafts, I was immediately interested in how the redesign came about and the development of the system. John Sweetwood from CCTY answered some questions about the development of the joint. During the joint's development many decisions were influenced by the current product's cost, and the end users in the bearing market. The team tried to answer questions about maximum strength, minimum mass, the angle range that could be serviced, material, mass production, and standard sizing. Working with their current customers provided insight into optimal standard sizing and design. Backwards compatibility proved to be a problem through the design as different splines, pinch bolts, double D shafts, through bolts, and male threads all required different connections. Several configurations are required to make the system backward compatible. The manufacturing challenge came when developing tooling for a part without flat datum surfaces. Tooling needed to hold the part during machining, keeping the axes offset by ninety degrees and maintaining equal sized cylinders while giving surface finish capable of acting as a slide bearing. 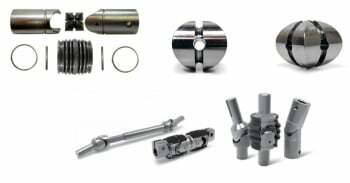 The square ball universal joint is a good story of a redesign that eliminated parts in an assembly to lower cost and supply larger loading zones and operational torques than standard needle bearing designs. A few patents and patent applications exist for this design, and include some additional insight about torque transmission. 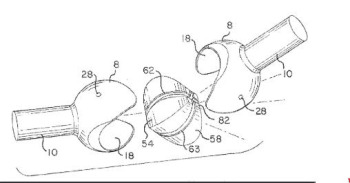 I'll be watching this application over the next decade to see how original equipment manufacturers embrace this design.